Foamex is a rigid plastic compressed PVC material suitable for indoor and outdoor signs. Foamex is relatively lightweight and is fully waterproof. 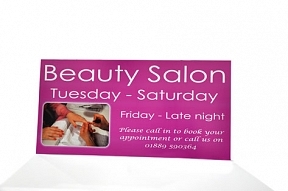 Foamex signs are available in 3mm, 5mm and 10mm thicknesses. 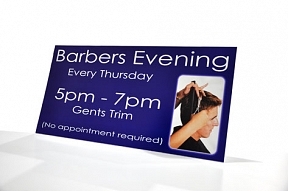 Foamex signs are a cheap option for shop front signs and many outdoor signage applications, they are very durable and the material can easily be drilled, screwed or even nailed to a whole range of surfaces. On larger signs we do recommend fixing your foamex signs to a backboard like a sheet of plywood. Foamex signs are often used for exhibition signs and displays. Suitable for both indoor and outside Foamex is a relatively lightweight material and it is fully waterproof. As such they are a popular choice for shop front signs and many outdoor signage applications. However, Foamex also remains a popular choice for exhibition signs and displays due to its clarity and versatility. Due to their durability these Foamex signs can be drilled, screwed or even nailed to a whole range of surfaces, making them incredibly versatile. If you are planning on using a large Foamex sign then we recommend fixing your Foamex to a backboard like a sheet of plywood in order to make your sign solid and improve the resilience of your sign. Foamex is sometimes referred to as Foamcore or Closed-cell PVC foamboardand its popularity dates back to the 1930’s where is has been used for Shop fronts ever since. The durability of Foamex can vary greatly but we promise that our Foamex can stand up to outdoor use and is resistant to direct sunlight and water. Unlike a PVC sign, Foamex is a lot lighter (as little as half the weight of solid PVC), highly resistant to moisture and some chemicals, and is very easy to cut and shape. It also rejects water, making it a great choice for outdoor signage. It is quite possible that many of the shop signs you see each day are made from Foamex. All of our Foamex signs are UV Stable with UV curable inks for added durability and a longer life. Your designs will be printed directly on the board to reduce the chance for imperfections and to ensure a high resolution sharp 1440dpi print every time. 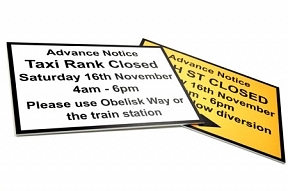 UV curable inks are the preferred choice for foamex signs as they are UV stable, hard wearing and have excellent colour reproduction. You can be sure that foamex signs printed by HFE Signs will be as sharp and as durable as possible, simply because we use the best printing practices with the best quality inks in the industry. Proof designs are issued to you by email before final printing to ensure that you are happy with your final artwork. HFE Signs offer a free design service on all products, including foamex signs. Who needs foamex signs and how will they help my branding? 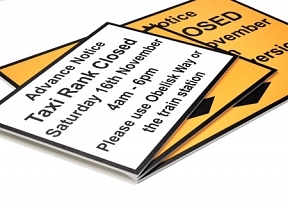 Foamex signs are used for a multitude of applications ranging from a small sign for a gate or door to very large exhibition or display boards. Foamex printing is achieved by using a flatbed printer with UV curable inks, the printing is applied direct to the board producing a finished sign that is outdoor durable and fade resistant. A Foamex printed board or sign can last outdoors for many years and offers a very cost-effective way to promote your brand, offer or raise awareness of your safety criteria. Foamex board printing is available in thicknesses of 3mm, 5mm or 10mm as standard as these are the most popular sizes that we carry in stock in sheets of 8ft x 4ft.